Erm. In the meantime, here, have a picture of one of the more interesting things happening in Bristol this week. 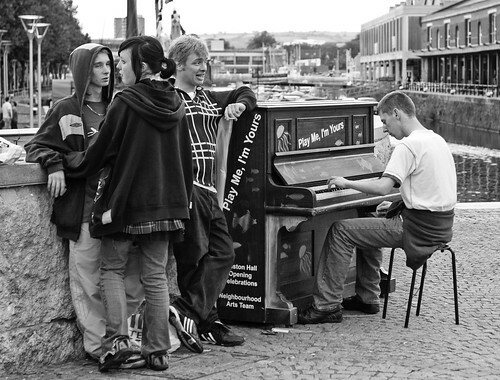 As we walked home from Brasserie Blanc on Saturday, we passed a large gang of youths, all male, at one of these pianos. At first, one of them was playing something almost tuneless and without skill but, as just as we passed, the same or a different lad started to play something really rather pretty. It was a lesson, if ever one needs one, not to judge these hooded, slouching, posturing teens on appearances! Not to jump to all kinds of assumptions about their skills (or lack of them). Sweet. I'm doing the C25K and my name is Matt (also carrying a few extra pounds doing the running thing). Friend me back if you'd like, I'm pretty boring though. Cool; consider yourself followed. More cowbell! Error running style: S2TIMEOUT: Timeout: 4, URL: gothick-matt.livejournal.com/213480.html at /home/lj/src/s2/S2.pm line 531.